Helping learners to deal with spoken discourse was a hot topic on my Diploma course. You might encounter the terms ‘interactional talk’ and ‘transactional talk’ when you get to modules on discourse analysis; a possible development task could be to devise a lesson based on things like ‘responses’ and ‘follow-up moves’. If so, I hope this post will help. I’ll introduce an approach to teaching spoken discourse markers, which is based on a task-based learning input session from my CELTA. Although these are two different communication skills, the definition suggests that one facilitates the other. In situations with a clear communicative goal we often incorporate interactional small talk, conversation or simple phrases. 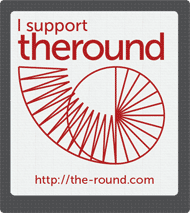 This help things run smoothly, help participants build rapport, help us express attitudes, etc. It’s a bit of a minefield for learners, particularly as discourse conventions between languages can differ greatly. However, if we don’t teach learners a few techniques to help them negotiate social interactions then we are depriving them of the chance to engage as naturally as possible. Responses to show surprise Really? Responses to show sympathy That’s terrible! I find task-based language teaching (TBLT) is a good route into spoken discourse. The general idea with this method is for students to prepare for and perform an activity which has a clear communicative goal or outcome. To achieve the outcome they may require certain target language. The teacher monitors students’ task performance and establishes any gaps they have in their knowledge – like certain grammatical structures or vocabulary they are missing. 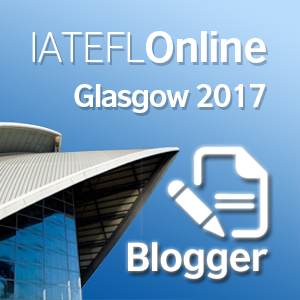 After the task is completed the teacher highlights any language gaps and provides relevant input or ‘upgrades’ to existing language. Students then repeat the task, hopefully incorporating the input provided by the teacher. Further feedback and task repetition may occur. Note: I did this with an intermediate group. This is a rough example, you might need more verbal/written instruction. Also, remember to do pre-task activities to help generate content. See an author like Nunan (2004) for more insight into TBLT. Monitor carefully and hear what type of conversation the students are coming up with, and any responses or follow-up moves they are making. Preferably(! ), students would record their conversations to refer back to. Take one example (or a rough version of it if they haven’t recorded it) and board it. Note: I did this with only two students, so I got them to do this task just before a lesson break, recorded it, and then transcribed it quickly over a cup of coffee. B: Ok. What’s the problem? B: Have you seen a doctor? B: Ok. have you taken any medicine? B: Is it that bad? How do I know what language to give the students? It’s a tough skill to react to the student dialogues off the cuff, so it’s preferable to gather a few ideas for potential target language at the planning stage. Perform the role play yourself before class with another teacher, and record it. Also, ask two other teachers to do the same thing. The latter idea is better as your own responses might be a bit contrived. Here, ‘fair enough’ might suggest that Speaker B is accepting the dismissal of their advice with neutrality, and might then follow-up with another piece of advice. There are other phrases that seem purely interactional, stuff like back-channelling (‘is it?’) and then strongly interactional phrases like ‘oh dear’, where the speaker might be genuinely showing sympathy. Of course, you’d never highlight ‘interactional this’ or ‘back-channelling that’ to learners. However, I’d say it’s good practice as a teacher to think of spoken discourse in these terms, as it helps you to address the underlying purpose of a particular utterance, and then think about how you can explain this simply to your learners. What is really, REALLY important here (in my humble opinion) are the aspects of stress and intonation that surround these utterances. Whilst I see the phrase ‘fair enough’ as a neutral way to bring closure to one particular idea, tweaking the intonation a bit could give the phrase an air of cynicism. Similarly, it’s easy to make the phrase ‘oh dear’ sound sympathetic or sarcastic. Getting students to discuss how their utterances differ and what this expresses should help them realise how intonation my change the way some discourse markers are interpreted by the listener. B: Oh no! Sorry. What’s the problem? B: Oh dear. Have you seen a doctor? B: Fair enough. Well, have you taken any medicine? B: right / if you say so / fair enough / hmmm / Is it? B: Really? Is it that bad? 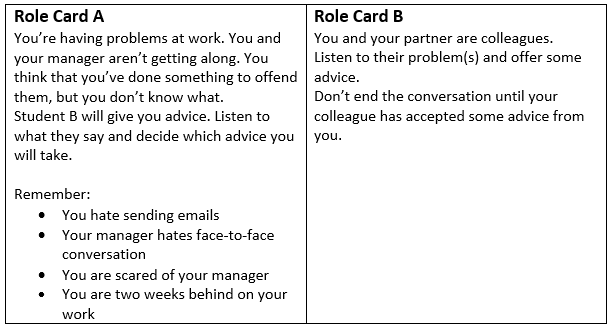 The language input you’ve decided on has come from your colleagues’ own attempt at the role play task. You’ve recorded it, so you might as well use it. If it’s not too complex, I would transcribe it and use it, but if you think their turn of phrase might be a bit hard to grasp, consider grading the text. Either way, let the students hear the text once first and provide a gist task (e.g. ‘What advice was given? Which advice was taken?’). Then give them a detailed listening task to write in the missing phrases, e.g. A: Hi ya, how are you doing? A: __[oh dear]_________, what’s up? Once the students have completed the conversation (and you’ve done feedback), have them discuss what they think the purpose of each phrase is. Let them listen to the text once more to do this, as the pronunciation of some phrases might help them generate ideas. Feedback as a group and clarify the meaning of each phrase. I recommend performing the phrases with a student, where the student makes the initial utterance and you respond – your body language and facial expression will provide very useful contextual clues for the learners. At this stage, be prepared to give detailed explanations. If you feel the students need a bit of scaffolding, you could prepare some questions to guide them beforehand, e.g. Do any of the phrases used show that Speaker B sympathises with Speaker A? Do any of the phrases used seem negative? Why/How? The amount you can prepare for this stage depends on whether you want to prepare all the target language in advance or not. If you want to give input based solely on students’ performance in the unfocused task, think carefully about how many phrases you want to introduce. B: ______________ what’s the problem? B: ______________ Have you seen a doctor? B: ______________ Well, have you taken any medicine? B: ______________ Is it that bad? …or have them look at the text and decide whether they could add the target phrases to any part of the dialogue. Monitor carefully, then ask students to practice the dialogue again with the new phrases included. At this stage, I would have them swap roles and repeat the task, taking away the model dialogue. I may even have them change partners and try the role play again, making use of the target phrases if they can. Freer practice of the target items is really important. It is a good idea to provide another role play similar to the first one, allowing students to apply the phrases in a familiar context but with a new challenge. 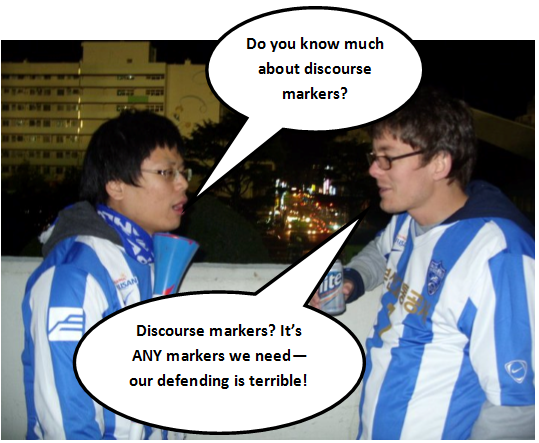 I hope this post has given you some ideas about how to approach spoken discourse markers. Please comment and share your own approaches, I’ll be happy to try them out and give feedback. Rather than focus on the area of spoken discourse, I prefer learners to discover their way through the linguistic chaos. After learners absorb the cultural interactions in the language that they are studying, they do discover, by their own awareness, of learning that there are particular functions in interactions within the language. 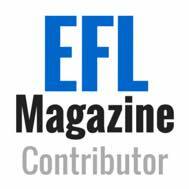 Anyhow, as a teacher who really does like to incorporate the humanistic side of language teaching, or an appropriate amount of Dogme, within my lessons, it is usual to encourage interaction and develop language within a natural and fluid lesson. Sometimes, my learners do go away developing not just the ‘bear knuckles’ of a particular language but they go away with something a bit more personalised and memorable than this and I do hope that the lexical chunks that they acquire can be incorporated at the most opportune time during a moment of discursive nature. 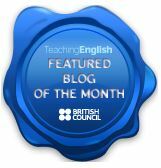 Wonderful blog post again Pete and I do enjoy your interest in the teaching English. I do hope you and your lovely partner are enjoying Asia. Keep up the good work. I see your point Sketch, this is the type of language that learners can absorb from their natural interactions. A lesson like this might help raise awareness of some discourse markers, but it’s not a substitute for authentic, real world interaction. Like yourself, I have dealt with chunks like these on a smaller scale, as an when required in class – perhaps a lesson focusing solely on spoken discourse markers is overkill. I really like this post. So practical and important to direct learners into natural communicative use of language in the language learning. I have never read a strategy which is so detailed and clear like this from the books I have read so far. 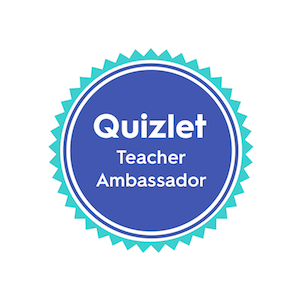 Yet, in my opinion, there is a great challenge on the part of the teacher, especially the non-native one like me, because it is of a must for the teacher to have good knowledge, mastery, and sufficient stock of natural discourse markers of the target language to be able to apply this strategy. I wonder if non-native teachers, especially in my context, have the required knowledge, skill, and repertoire on English discourse markers. As a non-native speaker, how would you approach this topic? Have you taught this type of language before… could you recommend another method you’ve tried? Hi Pete, I was lucky enough to stumble upon your blog via Twitter. The area of back-channel devices is one I honed into during DELTA and continued with until today. firstly, I will presenting on the topic In Barcelona next month and I would love to sight your example lesson plan above of how the language can come ‘from the SS’. Please free to contact me at myles@SLB.coop. MEDDINGS. L & THORNBURY, S. Teaching Unplugged, page 41, 2009, DELTA Publishing. 1. Pre-prepare a piece of good news and bad news to tell the class. Be sure to keep them light hearted the last things our SS need to hear is that there has been a death in the family, e.g. Good news: Last week, my brother told me he is flying to Barcelona in December to see me. 2. Ask SS if they would like to hear the good news or the bad news first, then share your news to the group. Allow the SS to react naturally and ask any follow up questions and allow the conversation to continue in open class or a while. 3. While the conversation is taking place, write down/make a record of the words/phrases the SS use to react in a notebook or on paper don’t board them at this point. 4. Handout the Student´s worksheet. Ask SS to write down in their own language one piece of good news and bad news they have received recently. 5. Ask the SS to share the news with a partner and record the conversation on their mobile phone (this should be no longer than a 2 min conversation). 6. Get the SS to listen to their recording and write down the words/phrases they used to react to their partner’s news. After, ask the SS to think about what emotion the person was trying to express when they reacted and write it next to the word, e.g. surprised, empathetic, not interested, concerned, etc. 8. Ask the SS to look back at the way they reacted and decide which of the phrases on the board could they could use to express the same reaction. 9. SS now have the conversation again in English, starting the conversation with Would you like to hear the good news, or the bad news first? 10. SS change partners and repeat the conversation. Hi Myles, thanks for such a comprehensive response! That lesson looks great, I’ll definitely give it a go when I get the chance. Shame the example board work doesn’t show up above though. When you’ve taught that lesson do students normally come up with a lot of phrases themselves or does it rely on your input? I remember a general criticism of task based learning methodology was that if students are capable of effectively performing a task first time round then do they actually require any language upgrade? I think your lesson above exemplifies why they do, as you’ve focused on emotion and attitude. A student might very well give an appropriate response (in this case to good or bad news), but there may be better or alternative ways to convey the emotions, which sound more natural. As you pointed out, the upgrade may be not just new language, but clearly demonstrating the correct intonation to convey your attitude. I overlook this far to often, so thanks for the reminder. Regarding your presentation, yeah use what you want, no problem! I haven’t flicked through Teaching Unplugged for a while now, better check it’s on the shelf in my new staffroom!